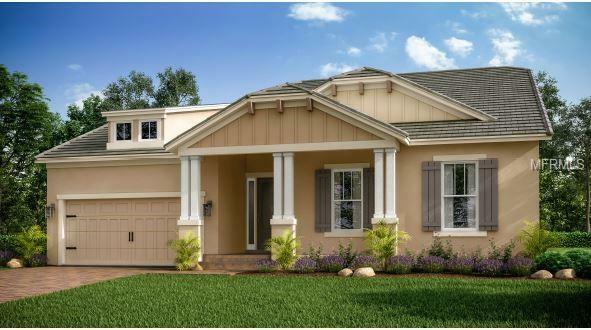 Under Construction - The curb-appeal of this single-story Amelia home is stunning! This 4BR/3.5 Bath contemporary-craftsman home includes an elevated front porch, flat tile roof, brick paver driveway, stone detailing, and lush landscape. Enter through a long foyer which opens up into the expansive dining and gathering rooms, showcased by soaring 10 ceilings and 8 interior doors throughout the home. The open-concept gourmet kitchen is light and bright with whte shaker-style cabinets and magnificent Cambria counter tops, under-cabinet lighting, stainless steel gas cook top, wall oven, and range hood. A large kitchen island overlooks the spacious gathering room, highlighted by tray ceilings and a pocketing sliding glass door leading out to the covered lanai. This home site can easily accommodate a future pool or outdoor area, and the lanai comes pre-plumbed for a summer kitchenperfect for your family to move-in and enjoy this spring! Photos are of model not actual home.Starkey Ranch is a beautiful 2,400-acre master-planned community. Amenities include a community pool and splash pad, 2 dog parks, a playground, picnic pavilions, an event lawn and five miles of paved trails. Plans for a future Starkey Ranch District Park include softball and multi-sport fields. Dont miss this opportunity to take advantage of pre-construction incentives and highly desirable home sites in Whitfield Preserve at Starkey Ranch.